When it’s freezing cold out and you’re already running late for work, the last thing you want to do is spend extra time waiting around for your windshield to thaw out. Fortunately, there are some nifty little tricks you can try out to speed up the process. Unless you park in a garage, you probably spend way too much time scraping the ice off your windows in the winter. These tips will save you time and effort. You know what they say: The best defense is a good offense. By covering your windshield at night with a large piece of cardboard, a folded sheet or a towel, you’ll prevent the glass from freezing over in the first place. Or, if you want to invest a little more money, there are magnetic windshield covers that keep snow and ice at bay. The iceScreen is a great one, and available on Amazon here. And a couple of plastic bags and rubberbands are all you need to keep those side view mirrors ice free, too. If you don’t opt to cover your windshield, ice preventers can be sprayed on each night to create ice-free mornings. If any ice does accumulate after use of these products, it’s usually a thin layer that scrapes off easily. De-icers are used in the morning. Simply spray them on an icy windshield and scrape as usual. You’ll find the job gets done much more quickly and with a lot less effort. Liquid Calcium Chloride Snow & Ice Melter doubles as both a preventer and de-icer, and can be purchased on Amazon for $15.99 a gallon. Most commercial de-icers work just fine, but they tend to be costly — not to mention they are chock full o’ chemicals. Luckily, it’s easy to make your own de-icer, and it works just as well as store bought. Fill a spray bottle with rubbing alcohol and add a few drops of dish soap. Mix it well and spray it directly onto your icy windshield. After a minute or two, most of the ice will be partly melted, allowing you to just brush it aside with your scraper. The readers at stretcher.com swear by a 3-to-1 white vinegar and water mixture sprayed on a windshield and say it works wonders as both a de-icer and ice preventer. A remote starter for your car will likely set you back a couple hundred dollars, but it’s definitely a worth while investment. 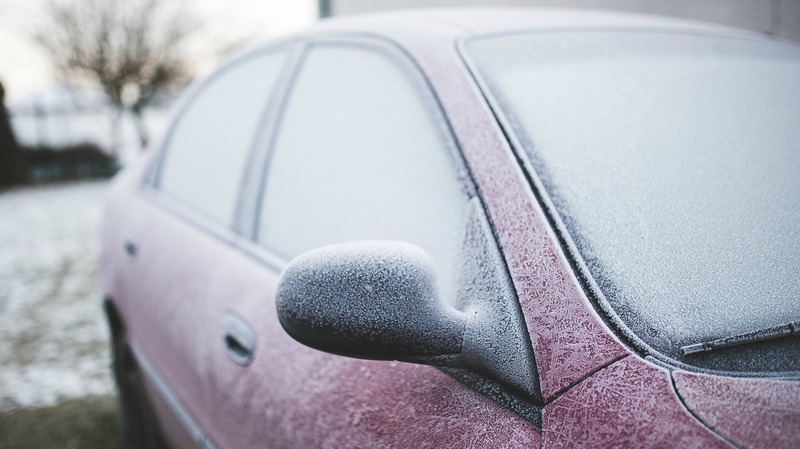 Simply use the remote to start your car while you finish up your morning routine, and minutes later, walk outside to a warm and toasty, completely defrosted car! Just make sure your heater is set to “defrost” when you park your car each night. Originally published October 2013. Updated November 2016.